Coolgear’s new 7 Port USB 3.1 hub is a compact solution using the newest technology. It’s uniquely designed shell expands your USB port usage by 7 from your USB 3.1 Gen1 host port. This is a self powered hub uses a +7~24V DC 2-pin terminal block power connector from the external power adapter. The 7-Port USB 3.1 hub supports up to 5Gbps of data transfer but is backward compatible with legacy USB 2.0/1.1/1.0 speeds. It can horizontally surface mounted to secure a stationary mount. This USB 3.1 hub is in compliance with USB battery charging for CDP and DCP modes. 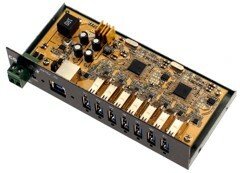 The hub supports 1.5A per port with a safety of 2A Thermal Shutdown protection.